The first step to your journey starts here. Choose the right program that equips you to become future-ready and life-ready after graduation. Be life-ready with the necessary skills and knowledge to be an in-demand professional. Develop the sought-after skills in the competitive IT industry with the Bachelor of Science in Information Technology program. Gain a great command of scripting and programming languages and train in hardware and software management, among many of the core subjects. 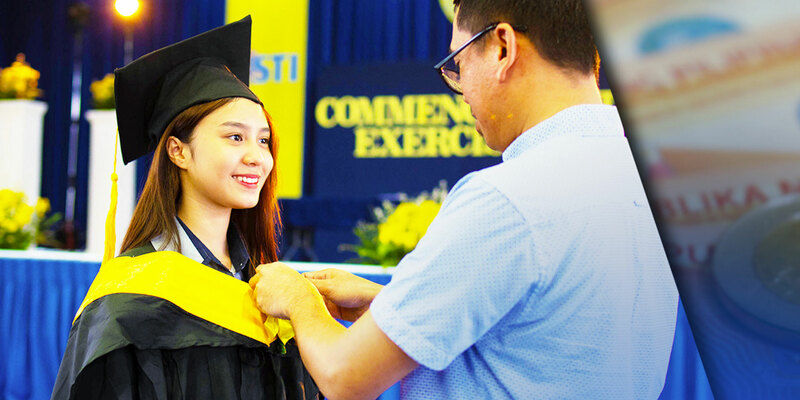 BSIT graduates will be ready to innovate with high-quality and complex infrastructures that make a difference in any business organization. Be at the forefront of emerging technology with the Bachelor of Science in Computer Science program. Build a solid foundation in programming, software engineering, algorithm development, computer architecture, operating systems and networks through the latest software tools and industry standard technologies. BSCS graduates will be equipped with strong technical skills to innovate computing solutions and programs across various industries. Train to be an indispensable IT professional with the Bachelor of Science in Information Systems program. Delve into the components, tools, techniques, strategies, and methodologies involved in the cycle of system development as the program exposes you to different Enterprise Resource Platforms. BSIS graduates will be ready to manage information resources and come up with novel business solutions. Earn TESDA National Certificates in various high-level programming with the two-year Information Technology program. The program exposes students to technical customer service environments. Jumpstart a career in the field of computer technology with the two-year Associate in Computer Technology program. Learn the fundamental competencies in the design and development of information systems, database management systems, and systems analysis & design. ACT graduates may choose to continue their studies in the related fields of computer science or information technology. Lead business ventures as a highly capable professional with the Bachelor of Science in Business Administration program. Develop an in-depth understanding of the operations of manufacturing, agribusiness, service enterprises, and all the aspects of operation within the organization. Its comprehensive curriculum combined with learning materials from industry partners will ready BSBA graduates for business. Master the language of business with the Bachelor of Science in Accountancy program. Train in-depth on financial accounting and reporting, cost accounting and management, accountancy and control, taxation, and accounting information systems. BSA graduates will be qualified to take the board exams and become Certified Public Accountants (CPA). Earn a competitive IT edge as an Accounting professional with the BS Accounting Information System program. Learn and practice the necessary competencies for accounting and bookkeeping, financial analysis and auditing, and other financial-related services while focusing on planning, controlling, and evaluating information systems. BSAIS graduates will be ready for business and are prepared to take global assessments for certification. Lead with highly competitive skills in one of the largest industries in the world through the Bachelor of Science in Retail Technology and Consumer Science program. Study technological disruptions in the retail industry, modern customers behavior, and how to gather and analyze big data in developing business strategies. BSRTCS graduates will be ready for the future of work with specialized skills in the areas of Retail Marketing, Consumer Psychology, Information Technology, and Data Science. Get ready for the future of business with the 2-year Associate in Retail Technology program. Develop a solid background in digital retail marketing strategies and how to analyze the modern consumers behaviors. The program also includes introductory courses in data science and business analytics. Be a tastemaker as an esteemed and skilled culinary professional with the Bachelor of Science in Culinary Management program. Train in fully-equipped commercial kitchen laboratories and hone culinary and foodservice skills fit for a thriving career in food service and hospitality. BSCM graduates will be ready for the culinary world. A finishing course for Senior High School graduates, the 2-year Professional Culinary Arts program provides students with rigorous training in a professional kitchen environment in preparation for a career in the foodservice industry. Graduates will also receive advanced TESDA national certifications in Cookery, Commercial Cooking, and Bread and Pastry Production. See how far you can go as a tourism professional with the Bachelor of Tourism Management program. Gain competencies in the different aspects of the profession including tour development, marketing, management and operations, among many more. BSTM graduates are ready to discover world-class opportunities in the local and international travel industry. The two-year Tourism and Events Management program prepares students to earn national certificates on local guiding, tourism promotion, travel services, attractions and theme park operations, front office, and events management. Train to be a creative professional with the Bachelor of Multimedia Arts program. Be exposed to a variety of design principles, creative techniques, and multimedia production that you can use to create dynamic artworks, motion graphics, and videos. BMMA graduates will have a diverse portfolio and will be equipped with the technical and artistic skills to bring their vision to life. Produce groundbreaking ideas and make your voice be heard with the Bachelor of Arts in Communication program. Develop a wide range of skills in radio/television/film production, journalism and broadcasting, integrated marketing research, and digital media, among others. BACOMM graduates are ready to inspire with stories. Be college-ready with the knowledge, training, and preparation to pursue a degree, start a business, or gain employment. Learn the basics of medical, engineering, and applied industrial technology courses in the Science, Technology, Engineering, and Mathematics (STEM) strand. Students who choose this track may pursue college degrees in Information Technology, Computer Science, Engineering, Medicine, Industrial Technology, and Science and Math Education. Earn the fundamental knowledge and skills to pursue a career in people-oriented fields in the Humanities and Social Sciences (HUMSS) strand. Students who choose this track may pursue college degrees in Education, Communication Arts, Psychology, and Sociology-Anthropology. Develop knowledge and skills that will prepare you for your next step in college or in life with the General Academic Strand. Learn effective communication skills, and gain knowledge and skills in preparing, conducting, and organizing interactive symposia, interviews, research, surveys, and recreational events about the present condition of the country using multimedia as one of the modes for learning. Students will be ready to pursue any college course they chose to pursue. Gain a solid background in business development, operations, and financial management in the Accountancy, Business, and Management (ABM) strand. Students who choose this track may pursue college degrees in Accountancy, Business Management, and Economics. Learn basic principles of diagnosing and troubleshooting problems in computer hardware and network systems through the Computer and Communications Technology program. Students who choose this specialization may pursue college degrees in Computer Engineering or Technology. Train in traditional and digital techniques used in stop-motion, 2D and 3D animation, character design, illustration, and storyboarding in the Digital Arts program. Students who choose this specialization may pursue college degrees in Multimedia Arts or Computer Animation & Illustration. Know the fundamentals of computer programming and scripting languages for websites and mobile applications in the IT with Mobile App & Web Development program. Students who choose this specialization may pursue college degrees in Computer Science, Programming, or Information Technology. Gain hands-on training in handling electronically controlled domestic appliances, mobile phones, and audio/video products in the Consumer Electronics program. Students who choose this specialization may pursue college degrees in Computer or Electronics and Communications Engineering. Learn basic principles of the hospitality industry, concierge services, hotel accommodation and reservation, and more in the Hotel Operations program. Students who choose this specialization may pursue college degrees in Hospitality & Tourism or Hotel & Restaurant Management. Be exposed to travel and tourism information systems, tourism marketing, airline ticketing, hospitality services, and other aspects of the tourism industry in the Tourism Operations program. Students of this specialization will be ready to pursue a degree in Hospitality & Tourism Management. Gain the basic principles of bartending, mixology, and the standard foodservice training in the Restaurant & Bar Operations program. Students who choose this track may pursue college degrees in Bartending, Food & Beverage or Hotel & Restaurant Management. Learn the basic principles of food preparation, food science, food handling, kitchen sanitation and safety, as well as planning and food costing in the Culinary Arts program. Students who choose this specialization may pursue college degrees in Culinary Arts or Hotel & Restaurant Management.